Savannah is known for its historic beauty found throughout the architecture and natural landscaping. Fence Workshop™ aims to maintain this natural beauty that so many people cherish Savannah for with every fence we build. 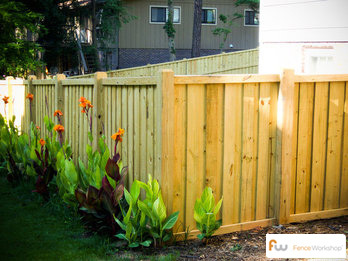 Wood fences provide a clean, natural and beautiful solution no matter what your fencing needs are. Fence Workshop does not currently sell wood materials to the public, however we strive to provide valuable information for customers looking for all types of fencing in Savannah, Georgia. When deciding what type of wood fence you’ll need, it’s important to know what you hope to achieve once your project is complete. Do you want privacy for your family or pool area? Do you want to protect your garden area while enhancing the overall aesthetic? Are you hoping to drown out noise from a busy street or neighbor? Or do you just need to establish property lines? Whatever your goal, the end result should be a solid, well built structure that if installed correctly, should last you many years to come. Wood privacy fencing can be found almost anywhere you look. They are a great choice for those looking to secure their properties from intruding animals or to establish a private oasis for your family and friends around the pool. Privacy fences are typically anywhere from 4ft to 8ft in height and panels should be built anywhere from 6ft to 10ft in length between posts. Your post size and style should reflect how decorative your wood privacy fence will be. If you’re adding a top cap or fascia boards and have exposed posts, you may consider using 6×6 pressure treated posts instead of 4×4 pressure treated posts. 6×6 posts are obviously larger, heavier, and will be more sturdy than 4×4 posts. 4×4 posts are usually sufficient for basic privacy fences with hidden posts, using just pickets and standard framing boards. Post length should be at least two feet greater than your fence height, as you or the installer should be submerging it anywhere from 18 – 24 inches into dirt. It is generally recommended to use Pressure Treated posts as they tend to hold up better overtime underground, delaying the rotting process. Wet concrete should be used to secure the posts in the post holes – you can take additional precautions to secure the post such as rebar or gravel to help protect the viability of the post and subsequently, your entire fence. Wood picket fencing is a perfect choice for those looking to give the front of their property an aesthetic facelift. It is also ideal for those with landscaping they would like to compliment, rather than conceal, with a natural yet decorative barrier. Wood picket fences are often scalloped or arched, with picket design options not always offered in privacy fencing. Some of these options include french gothic, dog eared, flat top, or spear top design. Pickets are generally placed anywhere from 1.5 to 4 inches apart depending on if you’ll need to contain small animals or children, privacy concerns, etc. Fence height in picket fencing is generally anywhere between 3ft and 5ft and pickets can be a wide array of sizes or dimensions. Most picket fences will have exposed posts, so 4×4, 4×6, or 6×6 Pressure Treated posts are all commonly used. Sections between posts should be 6ft to 8ft in length and framing boards will usually be 2 to 3 rail 2×4 boards. Both Cedar and Pressure Treated Pine have their distinctive advantages, and your budget, location and purpose will determine which choice is right for your project. Cedar is a beautiful, light weight wood that naturally has a multitude of benefits fence owners will appreciate. It resists warping and bug infestation, smells wonderful, and naturally transforms overtime from a beautiful red color to a stunning silver. Pressure Treated Pine also has unique characteristics making it ideal for use in long-term fencing. Because of the pressure treatment, the wood is meant to last in most any environment for 15 to 20 years. It holds up well when sitting in or very close to the ground, and is more economical than Cedar fencing. 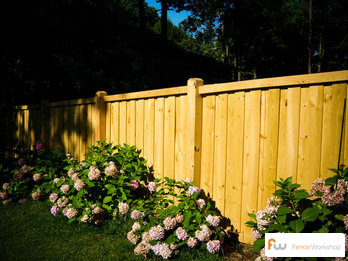 Pressure Treated Pine is a great option for those looking to erect a basic, utility driven fence. In either case, it is highly recommended to stain or seal your fence to increase the longevity of your investment. While we don’t offer installation services directly, we can give you tips on what to look for when choosing an installer. Make sure your fence installer is licensed and insured and knowledgable in the latest installation standards. Ask them how they secure the fence posts and at what depth, how many rails of framing they’ll include, and what kind of warranty they include on their installation practice and materials. If your property has inclinations and declinations, know whether the fence will be built to follow the contour of the ground, or if it will be stepped. The latter will create gaps at the bottom of the fence but may be more aesthetically pleasing depending on the style of wood fence you’ve chosen. Wood gates can become a source of frustration overtime as the natural material is bound to make movements due to weather changes and general use. Know what your installer is doing to mitigate these issues. One such precaution is using Cedar framing on gates to reduce the weight. Another good standard to follow is the use of 6×6 posts on all wood gates, regardless of size, as they’ll be stronger and less likely to sag. Remember, the key to avoiding any surprises along the way is to do your research and ask the right questions before mistakes are made! When ready to purchase a fence for your property in Savannah from Fence Workshop™, you can place your order directly through our fence materials website or, if you don’t see what you’re looking for, send us an email to get started.